LOS ALAMOS, New Mexico -- There is a new breed of weaponry fast approaching--and at the speed of light no less. They are labeled "directed-energy weapons" and may well signal a revolution in military hardware--perhaps more so than the atomic bomb. Directed-energy weapons take the form of lasers, high-powered microwaves, and particle beams. Their adoption for ground, air, sea, and space warfare depends not only on using the electromagnetic spectrum, but also upon favorable political and budgetary wavelengths too. That's the outlook of J. Douglas Beason, author of the recently published book: The E-Bomb: How America's New Directed Energy Weapons Will Change the Way Wars Will Be Fought in the Future (Da Capo Press, October 2005).Beason previously served on the White House staff working for the President's Science Advisor (Office of Science and Technology Policy) under both the Bush and Clinton Administrations. After more than two decades of research, the United States is on the verge of deploying a new generation of weapons that discharge beams of energy, such as the Airborne Laser, the Active Denial System, as well as the Tactical High Energy Laser (THEL). "History has shown that, without investment in high-technology, fighting the next war will be done using the last war type of technique," Beason told SPACE.com. Putting money into basic and long-range research is critical, Beason said, adding: "You can't always schedule breakthroughs." A leading expert in directed-energy research for some 26 years, Beason is also Director of Threat Reduction here at the Los Alamos National Laboratory (LANL) - noting that his views are his own and do not represent LANL, the Department of the Defense, nor the Department of Energy. Though considerable work has been done in lasers, high-power microwaves, and other directed-energy technologies, weaponization is still an ongoing process. For example, work is on-going in the military's Airborne Laser program. It utilizes a megawatt-class, high-energy chemical oxygen iodine laser toted skyward aboard a modified Boeing 747-400 aircraft. Purpose of the program is to enable the detection, tracking and destruction of ballistic missiles in the boost phase, or powered part of their flight. Similarly, testing of the U.S. Army's Tactical High Energy Laser (THEL) in White Sands, New Mexico has shown the ability of heating high-flying rocket warheads, blasting them with enough energy that causes them to self-detonate. THEL uses a high-energy, deuterium fluoride chemical laser. A mobile THEL also demonstrated the ability to kill multiple mortar rounds. Then there's Active Denial Technology--a non-lethal way to use millimeter-wave electromagnetic energy to stop, deter, and turn back an advancing adversary. This technology, supported by the U.S. Marines, uses a beam of millimeter waves to heat a foe's skin, causing severe pain without damage, and making the adversary flee the scene. Beason also pointed to new exciting research areas underway at the Los Alamos National Laboratory: Free-electron laser work with the Navy and a new type of directed-energy that operates in the terahertz region. While progress in directed-energy is appreciable, Beason sees two upfront problems in moving the technology forward. First of all, "convincing the warfighter that there's a niche for this new type of weapon," and secondly making sure these new systems are not viewed as a panacea to solve all problems. "They are only another tool," he added. Looming even larger is the role of those that acquire new weapons. "The U.S. could put ourselves in a very disastrous position if we allow our acquisition officials to be non-technically competent," Beason explained. Over the decades, Beason said that the field of directed-energy has had its share of "snakeoil salesmen", as well as those advocates that over-promised. "It wasn't ready for prime time." "It's a matter of priority," Beason said. The time is now to identify high-payoff, directed-energy projects for the smallest amounts of money, he said. In Beason's view, Active Denial Technology, the Airborne Laser program, the THEL, as well as supporting technologies, such as relay mirrors--are all works in progress that give reason for added support and priority funding. "I truly believe that as the airborne laser goes, so goes the rest of the nation's directed-energy programs. Right now, it's working on the margin. I believe that there are still 'unknown unknowns' out there that are going to occur in science and technology. We think we have the physics defined. We think we have the engineering defined. But something always goes wrong...and we're working too close at the margin," Beason said. Step-wise, demonstration programs that spotlight directed-energy weapon systems are needed, Beason noted. Such in-the-field displays could show off greater beam distance-to-target runs, mobility of hardware, ease-of-operation, battlefield utility, and other attributes. Directed-energy technologies can offer a range of applications, from botching up an enemy's electronics to performing "dial up" surgical, destructive strikes at the speed of light with little or no collateral damage. Beason said that one blue sky idea of his own he tagged "the voice from heaven". By tuning the resonance of a laser onto the Earth's ionosphere, you can create audible frequencies. Like some boom box in the sky, the laser-produced voice could bellow from above down to the target below: "Put down your weapons." Regarding use of directed-energy space weapons, Beason advised that "we'll eventually see it." However, present-day systems are far too messy. 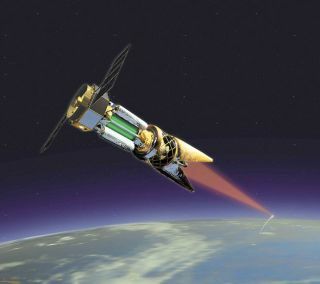 Most high-powered chemical lasers -- in the megawatt-class -- require onboard fuels and oxidizers to crank out the amount of energy useful for strategic applications. Stability of such a laser system rooted in space is also wanting. On the other hand, look to advances in more efficient lasers--especially solid state laser systems--Beason advised. "What breakthroughs are needed...I'm not sure. But, eventually, I think it's going to happen, but it is going to be a generation after the battlefield lasers." Yet, having the directed-energy source "in space" contrasted to shooting beams "through space" is another matter, Beason quickly added. Space-based relay mirrors--even high-altitude airships equipped with relay mirrors--can direct ground-based or air-based laser beams nearly around the world, he said. "So you're using space...exploiting it. But you are going through space to attack anywhere on Earth," Beason said. Late last year, speaking before the Heritage Foundation in Washington, D.C., Beason told his audience that laser energy, the power sources, beam control, as well as knowledge about how laser beams interact with Earth's atmosphere are quite mature. The technology is ready to shift into front line warfare status. "The good news is that directed-energy exists. Directed-energy is being tested and within a few years directed-energy is going to be deployed upon the battlefield," Beason reported. "But the bad news is that acquisition policies right now in this nation are one more gear toward evolutionary practices rather than revolutionary practices." "Visionaries win wars...and not bureaucrats. We've seen this through history," Beason observed.